Baby Boomers' retirement expectations are redefining an industry. Greasers, hippies, yuppies, trailing boomers, aging boomers…you name it and the Baby Boomers have been called it! This group constitutes the largest consumer demographic in our country. They are influencing their parents’ retirement choices, and they will define their own 20 years from now. Sixty-seven million strong, the Boomers were born at the beginning of a cycle of unprecedented American prosperity, power, and success. Valuing individualism, the most fortunate among them have experienced constant and consistent upward mobility; nothing is unobtainable. What are the Boomers’ retirement expectations? What do their preferred communities look like? How will they redefine service, quality, and environment? Why does it matter? Historically, the principle of design for residential facilities for the aging began with concepts borrowed from hospital models and the housing market. There was very little understanding of the users, few architects interested in the design of senior living facilities, and a belief that the facilities did not require marketing to secure residents. In recent years, this industry has been rebelling against a series of products based on consumer choice of 20 years ago to new models that require new thinking, new programs, and new design. Today’s consumer does not accept the “one-size-fits-all” approach. They want a residence that accommodates their widely varied circumstances and needs, provides a continuum of services, and offers quality across the board. Baby Boomers are in a wide range of life stages, and have a variety of experiences and values. The diversity of this generation presents many challenges to health care providers – it is imperative to consider a broad spectrum of services and options. Boomers and their parents have had different views of home ownership, influencing the decisions they make when choosing retirement housing. The Boomers, born in the post-World War II era, grew up in a booming economy. Rising incomes and plentiful jobs in the 1950s and 1960s set off an explosion of suburban construction and home ownership. Affluent Boomers are more knowledgeable and will demand more, looking to maintain their lifestyle, rather than conform to available products and services. Boomers’ parents, on the other hand, matured during the Depression or World War II when services and products were scarce or non-existent. Trained to save, this generation has typically moderated their expenses and approached their housing and needs more carefully and conservatively. As a result, over 75 percent of financial assets in the United States are held by people over the age of 55. Boomers’ parents, now well into their 70s and 80s, are making life-style and need-driven choices and may be more accepting of the status quo; their expectations for privacy and quality are again different than their own parents, who were raised during the Depression. - Possesses a philosophy and commitment to aging in place. Boomers want and will demand a lifestyle that supports their independence, with units that allow them to age in place, services that respect their dignity, and activities that allow for choice, self-governance, and physical well-being. The program and building design must be flexible, so that a change in physical or mental health does not necessitate a change in living environment. - Enhances customization and builds excitement into the dining experience. Residents want a range of dining experiences and flexibility. Retirement community dining programs have evolved to include diverse service options by introducing upscale restaurants, grill rooms, clubhouses, takeout, and display cooking. - Views wellness as a lifestyle expectation. The Boomer generation is competitive. Think about sports popular with Boomers, such as basketball, volleyball, and racquetball, and facilities that accommodate tournaments. Some Del Webb communities include lap pools with as many as six lanes for competitive events, indoor running tracks, and rock climbing walls. The Manor at Yorktown offers services by professionals certified in massage therapy, reiki, tai chi, yoga, and personal training. - Integrate and enhance the outside environment. Boomers will want a garden that they can dig in, not sit and stare at. Incorporate raised planters that permit wheelchair and walker access and eliminate back stress. Offer a range of heights so everyone can integrate gardening into their daily activities. Provide easy access to water and use containers that can be brought inside during cooler weather. At the Collington, residents grow their own vegetables in an irrigated hilltop garden. - Create an environment that is a continuation of Boomers’ lifestyles. How Boomers have lived, in terms of housing, amenities in their homes, space usage, etc. plays a significant role in determining whether living units will be seen as a continuation of their lifestyles or as an abrupt change. Create space for washers and dryers, walk-in closets, kitchens with up-to-date appliances, larger bedrooms, and multiple phone lines for computers and faxes. Options include combining units, “bump-outs,” and sunrooms. Boomers are used to purchasing services that make their lives more convenient. The Manor at Yorktown is one of the first communities to integrate technology applications into a solution that secures and enhances the environment. There is no need for residents to carry cash. They can shop at a general store using a scanner that adds purchases to their monthly statements. In the resident’s unit, an optional touch screen monitor makes it easy to order room services, such as meals or additional housekeeping, and also shop securely on the Internet, send e-mail, or communicate with other residents. Twenty-four-hour security through authenticated voice and face identification allows access to the building without the need to carry keys. Link with a college or university to gain exposure to new subjects and learning experiences to broaden residents’ horizons. This is also an opportunity to use college campus recreational facilities. Incorporate a Kinko’s-style service center, research facilities, and resident offices to allow residents to pursue educational and professional interests. - Provide privacy/personalization of space in nursing setting. Reduce/convert semi-private rooms into private living spaces. Boomers will demand private rooms with showers, etc. and a great deal of opportunity for personalization of space. Older models of sharing rooms won’t work for a generation raised with a strong sense of homeownership, turf, and privacy. - Assesses urban vs. rural locations. U.S.-based hospitality/hotel companies such as Hyatt and Marriott, and other residential builders like Brookdale, have been developing full-service, high-rise continuing care retirement communities (CCRCs) in major urban centers. Urban dwellers typically have a sophisticated interest in the urban experience, which includes the cultural and educational opportunities available to them. Facilities might also include lecture-style classrooms (with interactive video connections), appropriately sized rooms for recitals and other musical events, gallery-style spaces for art exhibits, and a library appointed with research level amenities. - Redesign the environment to support culture change and memory loss. Realize that what works well for people with dementia is also good for people who do not have dementia. Develop cluster designs that create small-scale environments within larger complexes. This concept permits flexible settings for a variety of special care needs ranging from short-term rehabilitation to dementia, and sub-acute and hospice care. J. David Hoglund, FAIA, is a partner of Perkins Eastman and the managing principal of the Pittsburgh office. 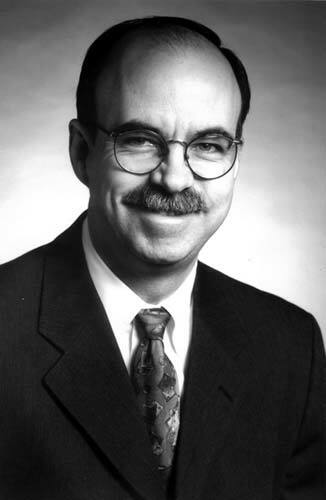 Hoglund has focused his architectural career on improving the quality of life of older adults through a new paradigm that combines housing and services in a uniquely residential setting by reforming building standards, and has changed accepted practice through research, writings, and presentations. Founded in 1981, Perkins Eastman is headquartered in New York and, with a staff of more than 400, maintains offices in Pittsburgh, Stamford, CT, Charlotte, Chicago, San Francisco, and Toronto. 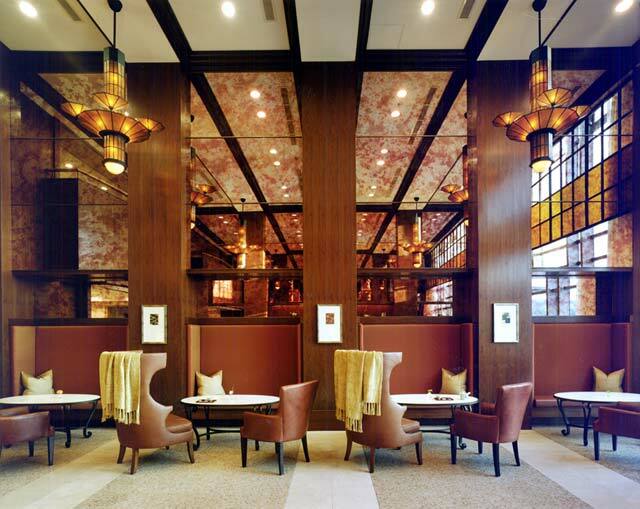 Sun City Takatsuki, Japan: The design emphasizes choice by creating a variety of public spaces, including this relaxing garden tea lounge with a warm palette of dark elm and mica panels. 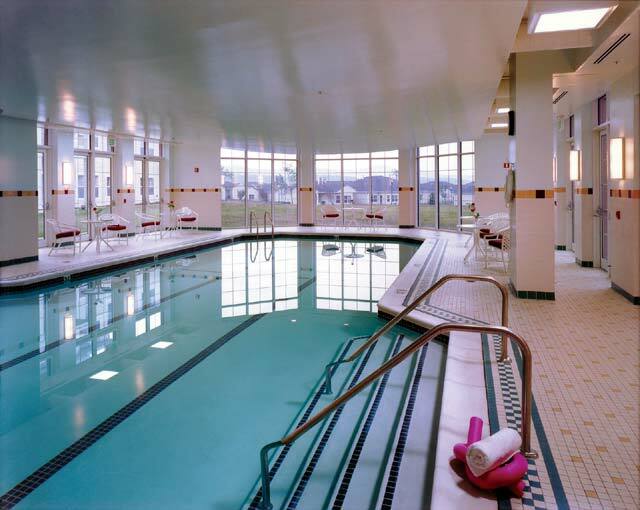 Buckingham's Choice, Maryland: Seniors see wellness as a lifestyle expectation, with an emphasis on activities that strengthen the mind and body...water therapy, weight training, and competitive sports are on the rise. 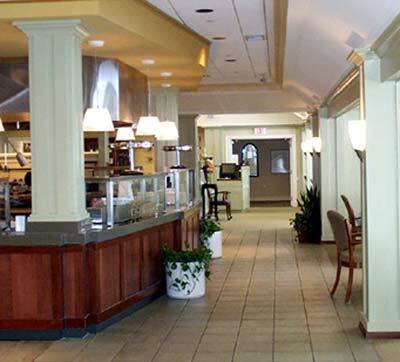 Collington Episcopal Life Care Community, Maryland: Dining becomes an event by with a "display cooking" kitchen in the middle of the dining room, offering residents individual orders and preparation. 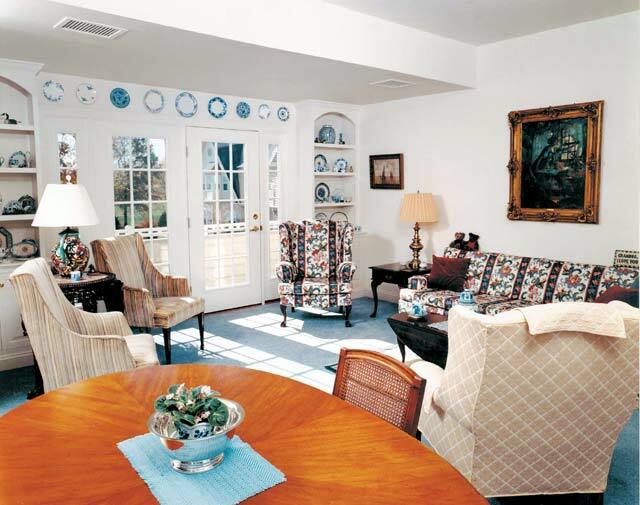 Manor at Yorktown, Pennsylvania: Each residence features a bright garden style living room and a fully equipped kitchen and laundry. It is one of the first communities to integrate technology such as touch screen monitors making it easy to order room services, access the Internet, and send e-mails.